I love receiving gift cards … especially to coffee shops! They just seem such decadent gifts to receive. They allow me to drive-through for a favorite drink, or take one of my daughters out for a treat … and it is free for me. The best thing is, it is the gift that just keeps on giving, because usually there is still a balance on the card to use at another time. Recently I was reminded of what gift is better than a coffee gift card. The other day, a student was excited to see me as he walked into the front doors of the school. I stopped to greet him. With a million dollar smile all over his face, he said he had something for me. An end of the year, thank-you card was placed into my hand. It was handwritten by him … “Mrs. 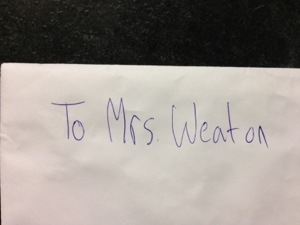 Weaton” written in one corner … his Mom did not help with this card (my last name is spelled Wheaton). I have to say, seeing the misspelling of my name made me more eager to open and read what was inside, but I was in a bit of a hurry to reach another destination, and had already chatted longer than the time I had. We said our good-byes, and I promised to see him later that afternoon. I could not wait to open the envelope, and read what he had written inside. When I did finally have the opportunity, his words filled me with pride in how well he communicated, how neat was his handwriting, how specific the events of the past school year he communicated. His note was full of reminders (to me) of what he and I, and others, had shared this school year. Even though our schedules were such that we shared so little time together this year, we had shared so much with the little time availed to us. I smiled as I absorbed each word, my heart filling with each deposit. My deposits to him were born out of a pay cheque … his deposits to me were born out of thankfulness. My deposits to him came from my strengths … his deposits to me were born out of his weaknesses. My reason for working with him was his disability … his reason for writing this note was his abilities. This note, full of memories and thanks, is far better than any gift card … it is truly the gift that keeps on giving … because there is always a balance still left on this card. This is the big week for exams at the school I work, as well as for those living in my house. In our house the stress of writing exams comes out in as many ways as there are individuals under the roof! There is the chocolate-lover, the study avoider, the tummy-acher, the movie watcher, the mom and dad chatter, the bedroom-cleaner, the carb-eater, etc., etc,. etc. In my job in a high school, I love when I get to supervise, read or scribe for a individual or group while they are doing their exam. For me, the best part of this task is that I get to pray for the students before they start their exams (I work in a Christian school, so I have the freedom to do this). For so many (I expect for all) who are writing exams the stress can be overwhelming, and praying for those students is the greatest gift and assistance that I can give to them. I believe that praying does not give the students a better ability to access the knowledge and facts that they have learned, it does not give them a magical power where the control of their pens is removed from their hands, and the right answers all get written on the lines. What I believe that praying for them does accomplish is that it sets the atmosphere for the peace, that only Christ can give, to allow them to relax and remember what is important, and who is in control. thank-you for allowing us to have breath, and health. thank-you for giving us the strength and ability to be here today. they need to know that you are here with them. help them to have the time to complete this exam before them. nor will their mark change who they are in Your eyes. remind them they are not alone. With less than four weeks until the end of regular classes, followed by two more weeks of exams, and end of year procedures, school students and staff have summer on the brain. With each pro and con comes a beautiful reality … in the field of education each year is a fresh start, a brand new beginning. No matter what kind of year this school year has been (whether staff or student), a brand new next year awaits us all in September. It reminds me of the Easter-related phrase “it’s Friday, but Sunday’s a coming.” A phrase about the sorrow of Good Friday, the day that the Christ was crucified, died and placed in the tomb. The day of much sorrow and sadness. But within the phrase is the essence of the light at the end of the dark tunnel … Sunday, the day Jesus rose from his death, the day that God hit the re-set button on human history, and hope was restored. you have the hope of starting fresh like a brand new piece of lined loose leaf, in a brand new binder, with a freshly sharpened pencil in hand. But, we don’t have to wait for September for things to get better. Complete that notebook with the best essay of the year. Complete those classes with the most enthusiasm of the year. Complete those report cards with encouraging words. Maybe even write a note and place it in your kid’s lunch, or volunteer (again) for that last field trip. Stay Strong … Finish Well! I Got To Shoot My Students! And they even shot me back! Of course we were playing Lazer Tag, so the shooting was all on the up and up 😉 . When my children have friends over, my life becomes easier, for many with children with special needs, having a friend over can be more planning, more work, more exhaustive. Months ago I had written a previous post of these “Moms That I Admire“, and in that mom’s facial expression of ‘momma guilt’ I was reminded again of how very heavy the burden of raising a child with special needs can be. As the momma-guilt look showed all over this lovely but weighted down parent, the commitment from these child dedication ceremonies reminded me that part of our task … as Christ-followers … as friends … as schools, is to come alongside of these families. These families raising a child with special needs, need the support of His people, His churches and schools named for His Son to do the job well. And I thought, “wouldn’t it be great to support these two families in a practical way.” So, the dreaming began. Then the dreaming was shared with a co-worker, and we began to run with it! In the end, my co-worker and I, along with twelve students (half deemed ‘special ed.’ and half not or ), and a school alumni, left school at noon on a Friday , leaving their classmates to snooze through their afternoon classes. We donned the vests of the battle, issued mortal threats, complete with evil laughs, chose code names, then we marched off to battle. An hour and a half later, sweaty and sticky (and stinky) … and laughing with great memories made, we headed for Slurpies, then a slow drive back to school … we didn’t want to get back too early … that would have meant having to return to classes! But the goal was NOT academic, it was purely social skills. About half of the students are designated ‘special education’ students, and learning the skills to be socially acceptable in the larger society is a main factor in their learning (of course if anyone walks the halls of any high school, the majority of students might seem to need social skills learning … heck, if anyone were to walk into the staff room … but, I digress 😉 ). The best place to teach and reinforce these skills is in a true social setting, not in a classroom. These students got to talk, interact, laugh and observe their more ‘typical’ peers in a social setting. There was no ‘us’ and ‘them’ that day, only ‘we’. The ‘typical’ students got to be noticed for the intrinsic way that they already care for their peers … a ‘thank-you’ that most probably did not feel necessary, as they are who they are because that is how they have responded to God’s call to “love their neighbor, classmate, as themselves” (Mark 12:31). These ‘typical’ students were chosen by their ‘not so typical’ peers … no higher praise could be earned! I cannot wait to see and hear the interactions, and rehashing of memories next week in the halls and classrooms of school. I hope he does, I know I will too. Sometimes things happen, words are said, events enfold, and the lack of human intervention into how they enfold makes me thing that the events are fully and completely a God thing. I have the privilege of co-leading a homeroom at the high school I work with a teacher who is about as laid back as myself. We both want the group of students to feel that it is a place of freedom, of acceptance, of our genuine concern and interest in them. We do not meet that often for homeroom events, but both the teacher and I are intentional at catching up with the individual students when we see them in the hallways. Recently we had a homeroom event scheduled and I was feeling insecure. The goal of the event was to consider three fundraisers that are happening in our school over the next number of weeks (through a number of videos and discussion), and to commit, as a homeroom group, to a specific fundraiser and goal. If I know one thing about myself, it is that I am NOT a salesperson! And the thought of failing miserably with these very valid, very worthy fundraisers put a true spirit of heaviness within me. Thankfully, I do not lead this group alone! The door to transparency was opened, and what followed, well, I believe was nothing less than a God thing. It became apparent that the students were looking for something or someone to help that they could relate to, that they could more personally know to whom their gift, their money was going. I thought there were two boys, about thirteen and about ten. I wasn’t sure, but said I could find out later that day. … this is where one of the students became passionate. Not a student who I would have expected to become passionate … one who spends more time with administration that with classroom teachers. His tongue was loosed … “I’ve got lots of skater t-shirts, and even new jeans that I don’t wear,” and on, and on he went. The resulting conversation was that I would get the details for everyone, and see if we could piggyback on the retailer’s staff gifts. The students (and teacher and myself) agreed to bring in $5-10 each, and gifts for these kids would be bought. The students left the room … excited, passionate! The teacher and I were pumped! And oh, how we hoped and prayed that one of the sons was into skateboarding! Well, the store agreed to allow us to join in … and maybe even join in the delivery of the gifts.